We are delighted to publish our most recent CIMA Case Study pass rates for FI London. For the August 2016 sitting we achieved a 100% pass rate for all Management and Strategic Case Study students studying via FI Go courses. We also achieved a 100% pass rate at Operational and Management level for all FI Go Live students. This is a fantastic set of results and our students should be very proud of their achievements! 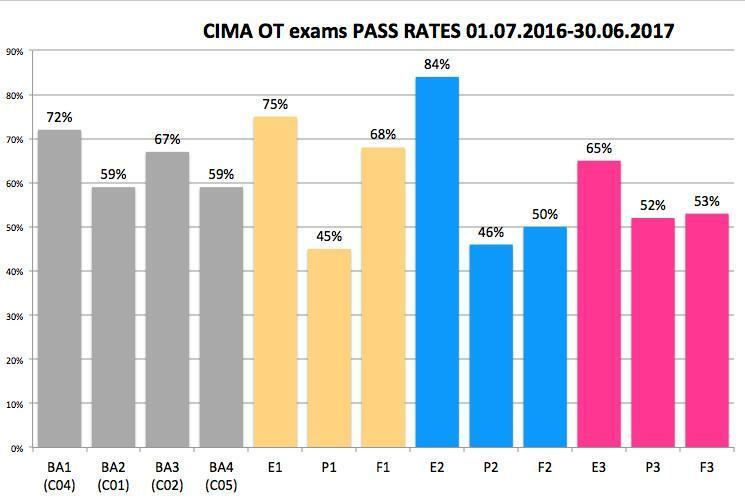 CIMA has been running the new 2015 syllabus for over 2 years, so I thought it is high time to have a deeper look at the exams pass rates. I will not bore you with a full statistical analysis, because that is not the point. As a CIMA student, you should understand the numbers and get some insights from them. So here it goes - the most recent released data is from March 2017. (UPDATE - this article has been updated to show the most recent data from July 2017). 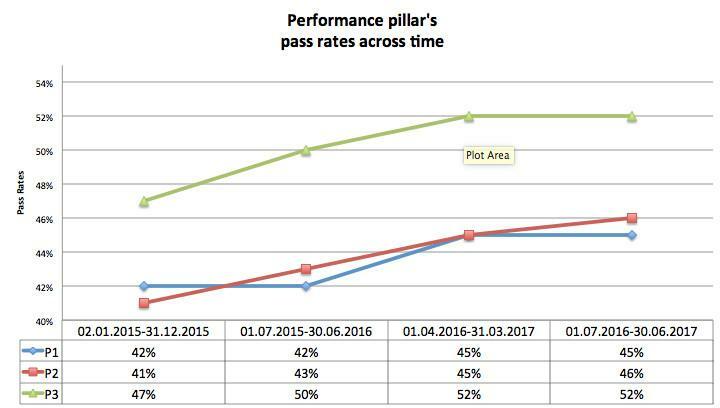 According to the graph, the P pillar seems to cause the most of the problems for the CIMA students. P3 and F3 have a passing rate of 52% & 53% respectively. 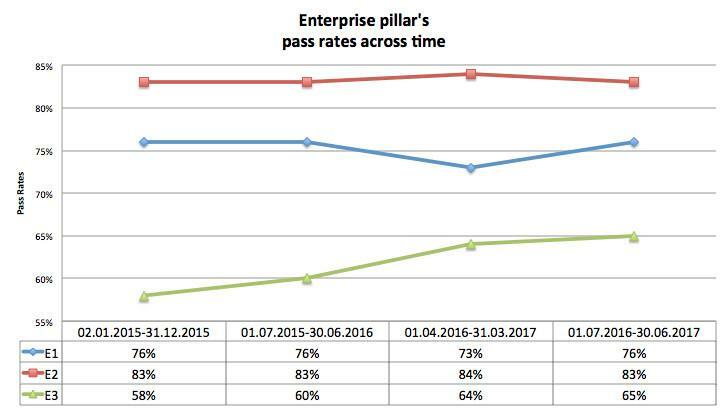 On the contrary, E pillar seems to get the highest scores. So if you don’t know how to approach a certain level and if you’re motivated by a success, attempt E paper first. The same goes for the E papers. We are individuals and we have a preference towards a specific pillar. For instance, my preference rating is P > E > F. I always passed P without any problem, on the first sitting. F was always a big stretch for me as first of all, I am a converted management accountant (I prefer the management part of that phrase ;) ). I had financial accounting subjects during my university time, I had some exposure at work, but I’ve always been an auditor or a controller. And that explains why P was the strongest. Statistically I’m among the minority here. My point is that everyone has a preference towards a certain pillar (paper). If a failure puts you off, start with a topic you enjoy the most. 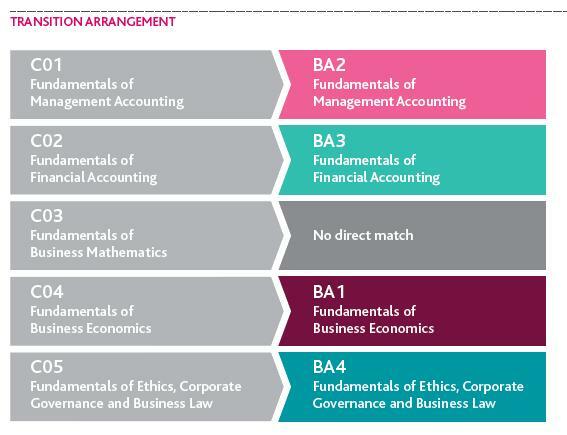 If you are new to CIMA and cannot really judge based on the papers’ names, look at the syllabus. And if you still don’t know and you need a success to keep you going, go for E papers first. Questions have been slightly revised and therefore the exam’s difficultly has slightly decreased. Students become more comfortable with CBA (Computer based Assessments). This is really a high-level overview. it would be really interesting to dive deeper and see which parts of P pillars are causing so much difficulty. But… the high-level data is all we have. Practice Tests Academy’s tests have built in functionality to always inform you how well you’ve done on a specific part and within a specific chapter - so you know where you need to improve. I’d like to see that kind of data coming from CIMA’s exams one day. PQ magazine published in March 2017 an article with the following increases in the pass rates year-on-year. E1 0%; F1 1%; P1 5%; E2 1%; F2 10%; P2 6%; E3 5%; F3 9%; P3 9%. That is not really what my data is telling me… CIMA prepares the pass rates every quarter but so far, it officially released them twice since January 2015… I believe that PQ was privy to some more detailed data (full 2015 and full 2016). That’s why I believe it is so important to properly plan your preparation. Kaplan has recently done a research and the outcome was that the more knowledge checked (revision questions) you embed in your studying process, the higher chance of passing the exam on the first try you will have. 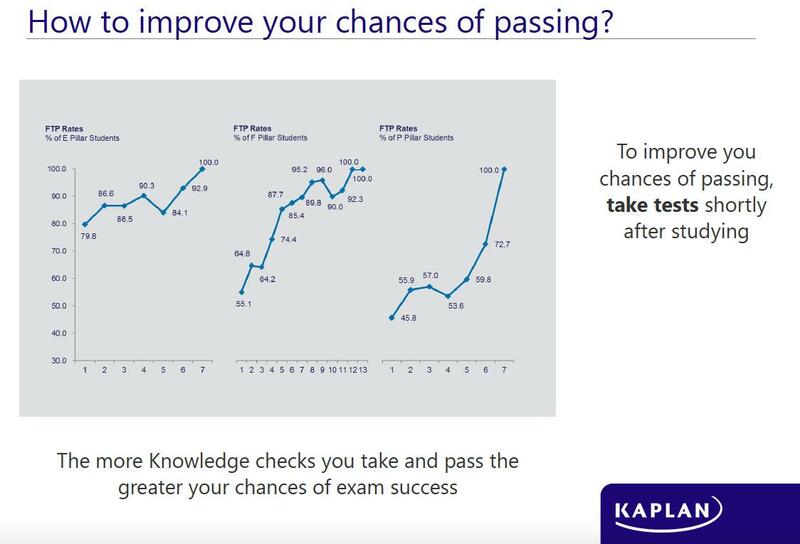 That is the screenshot I took during Kaplan’s webinar about CIMA exam success. FTP means First Time Pass rate. It represents only the Kaplan’s students population, but I think it is safe to say that it relates to the whole CIMA students’ population. The outcome is simple - you need to practice more in order to pass.That was the reason why we created Practice Tests Academy in the first place. Here is a little problem. The new syllabus started only in January this year (2017), so there is not enough data to show you the evolution of the BA1-BA4 pass rates (CIMA agreed to release the first data in July). However, we can still get a feeling how that could look like if you look at the C01, C02, C04 and C05 papers. 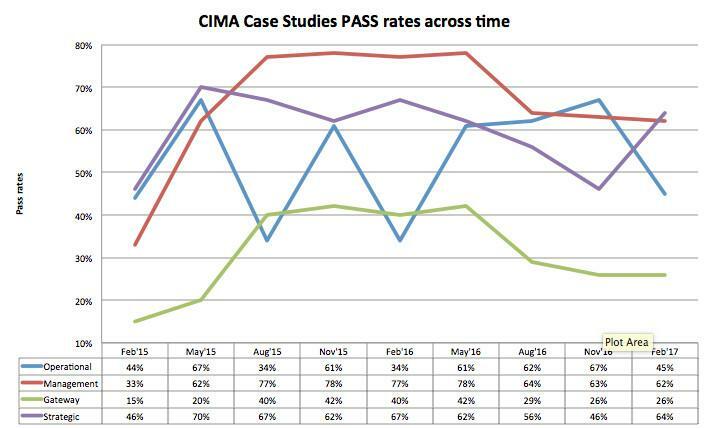 Update: The outcomes of the last pass rates published by CIMA are terrible! I thought I got my numbers wrong, so I triple checked them! It is true. BA2 was kind of "going downhill" but reaching 59%, that is a bit of an exaggeration! 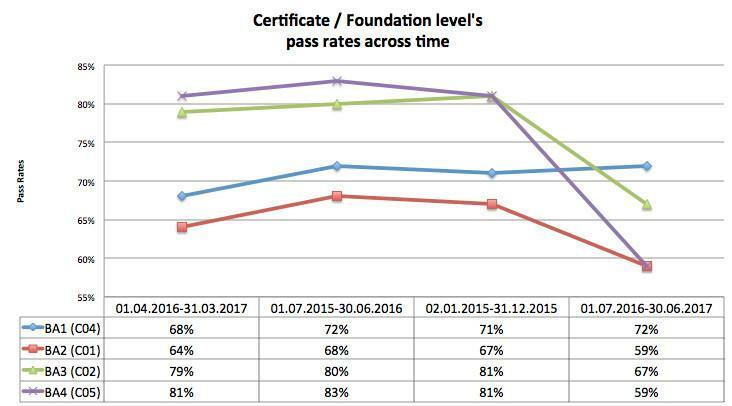 And the fact the "always with good pass rates" BA4 has almost reached the bottom, it is astonishing! We should ask - what does it mean? Either the quality of the students has decreased (difficult to believe in that) or CIMA has embedded too many tricky questions inside their tests. Maybe it is because BA4 has 85 questions and not 60 like any other tests. That is a new feature - and I am tempted to point out that the numbers indicate that 85 questions might be an overkill. But that is just my humble opinion. Frankly, I don’t even know how to interpret that. Let’s try. MCS students are doing pretty well. 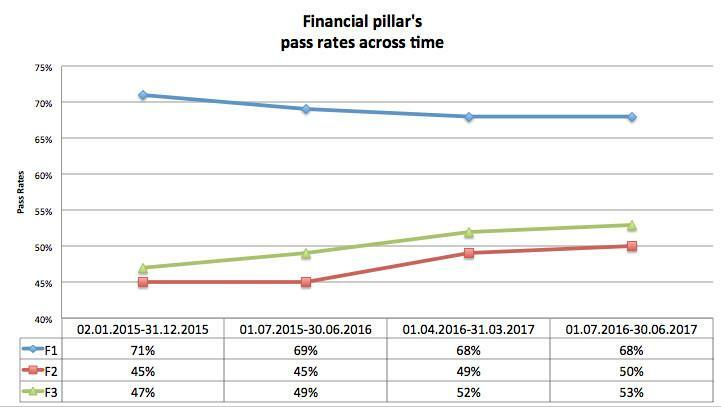 The pass rate is above 60% and even it was close to 80% during 1 year period. In one of my previous blog posts on How to pass your MCS I recommend that you shouldn’t do it alone, meaning that you should actually sign up with a tuition provider because otherwise you will waste a lot of time and you risk failing the exam. Retaking the exam costs more than signing up for the basic online package for MCS - so why to risk wasting money? If you would like to be informed and get some free materials for the upcoming MCS, just sign up below and I will definitively keep you informed of the content and the dates we release MCS (it should be around the time the pre-seen is released, which is 29th of September 2017). Gateway - what is sad though, is the pass rates of the CIMA Gateway exams. Just to remind you (in case you forgot), Gateways exams are actually MCS (no difference as per the content of the exam). However for Gateway students, this is their first point of contact with CIMA and it is assumed that the knowledge that they should have gained if they didn’t have the exemptions, is there. Frankly, it is a lot of materials to cover because you need to review the whole Operational and Management level papers (CIMA also suggests to review the Foundation level, but I think this is a bit of a overdo). Here I strongly suggest to sign up for a revision course designed specifically for the Gateway students. We will have the revision materials, however they are aimed to refresh your knowledge only. However, if you would feel confident to revise the material on your own, I think it is a great resource to make sure you covered and understood the content of all the previous CIMA papers.